One study estimated about 460 individuals; other, similar estimates of 300-500 individuals. Lifts its body, moving forward in waves (similar to an earthworm's crawl). Also moves by undulating S-shaped movement (common for snakes). Shy, calm. Little studied in the wild. Insects, small mammals (rodents), and frogs. Thought to have few predators. 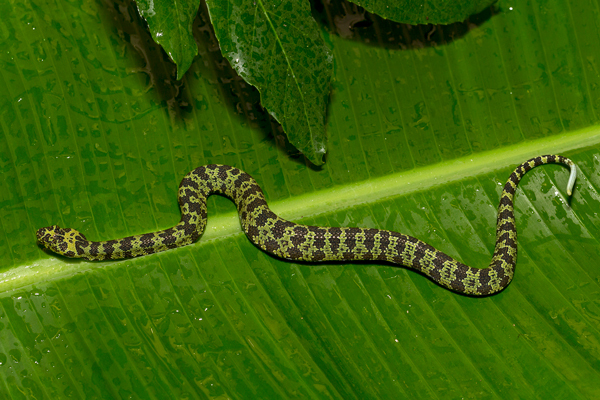 Most pit vipers give live birth, but the Mangshan pit viper lays eggs. © 2011-2019 San Diego Zoo Global. Minor conservation update in 2017. Population estimate updated Mar 2019.